Are you an angler who would like to see the statewide possession limit double in all statewide and special regulation seasons? 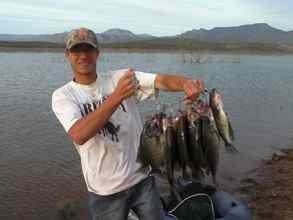 Should the crappie daily bag limit be reduced from unlimited to 15 per day at Bartlett Lake and Roosevelt Lake? In order to conserve fish populations, simplify and streamline regulations, and incorporate public request, the Arizona Game and Fish Department is considering these fishing regulation changes and others. The department is conducting a series of public meetings during June and July to provide information on the proposed fishing regulation changes and solicit comment. Flagstaff Regional Game and Fish office, 3500 S. Lake Mary Rd., June 24, 6:30 p.m. Mesa Regional Game and Fish office, 7200 E. University Dr., July 2, 6 p.m.
American Legion Post 19, Yuma, 2575 S. Virginia Dr., July 3, 5:30 p.m. Tucson Regional Game and Fish office, 555 N. Greasewood Rd., July 10, 6 p.m.
AZGFD Headquarters Office, Phoenix, 5000 W. Carefree Hwy, July 15, 5:30 p.m. Kingman Regional Game and Fish office, 5325 N. Stockton Hill Rd., July 19, 6 p.m.
Pinetop Regional Game and Fish office, 2878 E. White Mountain Blvd., July 19, 6 p.m. In addition, the public can also submit written comments via email to fishregscomments@azgfd.gov or by mail to: Arizona Game and Fish Department, Fisheries Branch, c/o Chris Cantrell, 5000 W. Carefree Highway, Phoenix, AZ 85086. The changes are scheduled to be presented to the Arizona Game and Fish Commission at its meeting scheduled for Sept. 6-7. Change the statewide possession limit to twice the daily bag limit. This possession limit will apply to all statewide and special regulation seasons. Reduce the crappie daily bag limit from unlimited to 15 per day at Bartlett Lake and Roosevelt Lake. Establish special regulations for daily bag limits at all newly designated Community Fishing Waters. Make all catch-and-release trout waters artificial fly and lure only, single barbless hooks. Simplify artificial fly and lure regulations at waters with reduced trout harvest to "artificial fly and lure only, two trout daily bag limit." Create special regulations for bass at Goldwater Lake of one bass, minimum size of 13 inches in total length. Allow bow and arrow fishing for catfish at Roosevelt, Apache, Canyon and Saguaro lakes. Allow spear and spear gun fishing for striped bass in the Colorado River and associated backwaters from Headgate Rock Dam (upstream of Parker) to the Southern International Boundary with Mexico. Reduce the general statewide daily bag limit for white amur (grass carp) from unlimited to one white amur, minimum size of 30 inches in total length. Reduce the statewide roundtail chub daily bag limit from one fish to catch-and-release only. Consolidate regulations on the Colorado River from the I-40 Bridge to the Southern International Boundary including Lake Havasu, Martinez Lake, Mittry Lake and associated backwaters. View the full details of the rationale behind each regulation at www.azgfd.gov/h_f/regChanges/130614_Fish_Regs_Full.pdf.